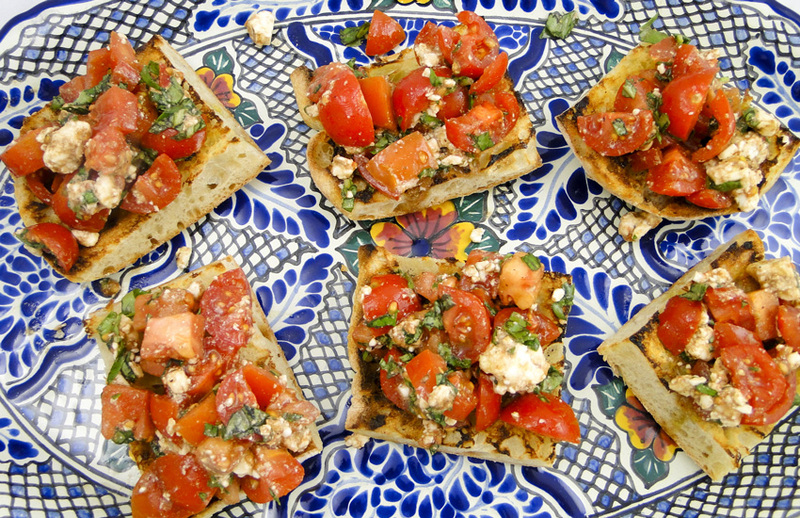 My family LOVES bruschetta, and there are times when we have eaten it almost nightly. 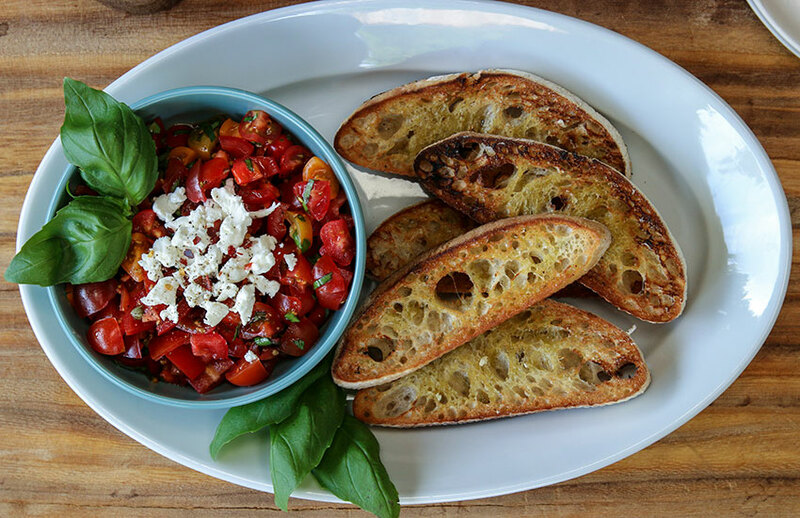 It is so easy to prepare that I don't even think of bruschetta as worthy of a recipe, but my children tell me otherwise and have asked that I write it up. After a friend of my daughter's recently came over to our house specifically to learn how to make bruschetta, I am complying. 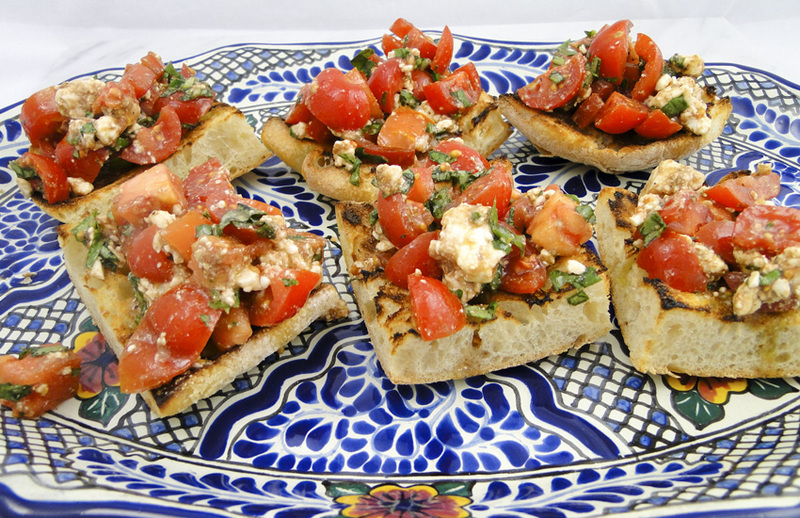 While I am writing up this basic recipe, I encourage you to go forth and make bruschetta without a recipe. 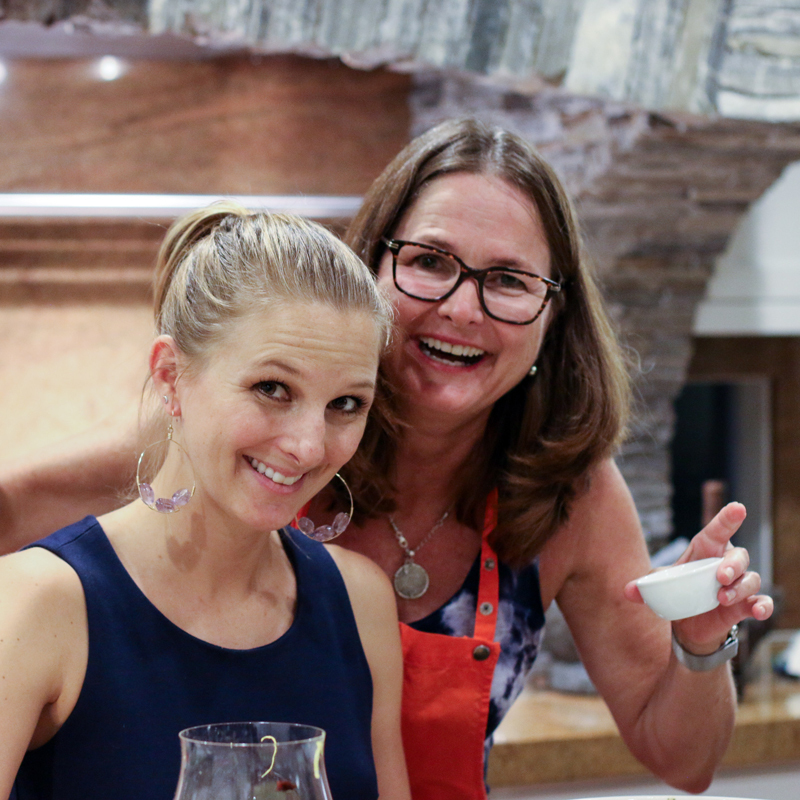 Use fresh or roasted tomatoes, whatever herbs you have in your fridge or garden, add avocado or capers, play with the cheese, and explore other vegetable combinations. 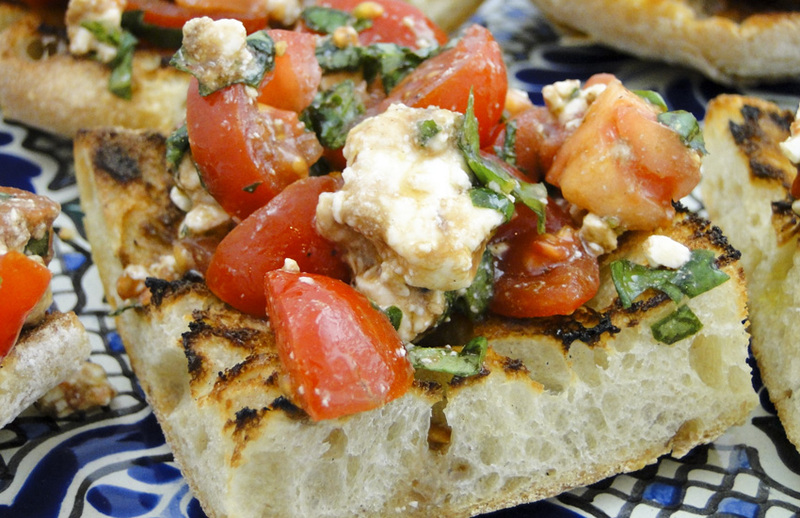 Use feta, mozzarella, burrata, parmigiano reggiano, goat cheese or no cheese at all. Add a splash of olive oil, some flavorful vinegar, salt and pepper, a pinch of red pepper flakes, and prego, you have a perfect appetizer, or even a wonderful meal in itself. I generally use La Brea ciabatta bread because its large air holes are great places to soak up a little extra flavor, but any good quality bread will do. Slice the bread, brush it with olive oil and pop it in the broiler until it begins to brown. Sometimes I toast just the tops of the bread and other times I flip them over and toast both sides for extra crunch. To really enhance the bread, take a peeled clove of garlic and rub it over the toasted bread. You need go no further, because garlic-rubbed toast is a treat in itself. 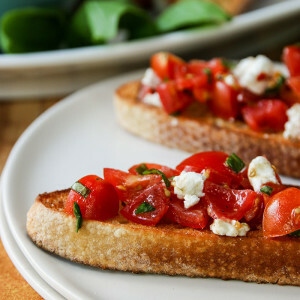 Or continue on and add your bruschetta toppings. I like to use cherry tomatoes because of their extra flavor and nutrient value. 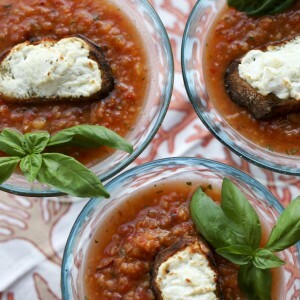 You can also roast roma tomatoes for a really special treat. 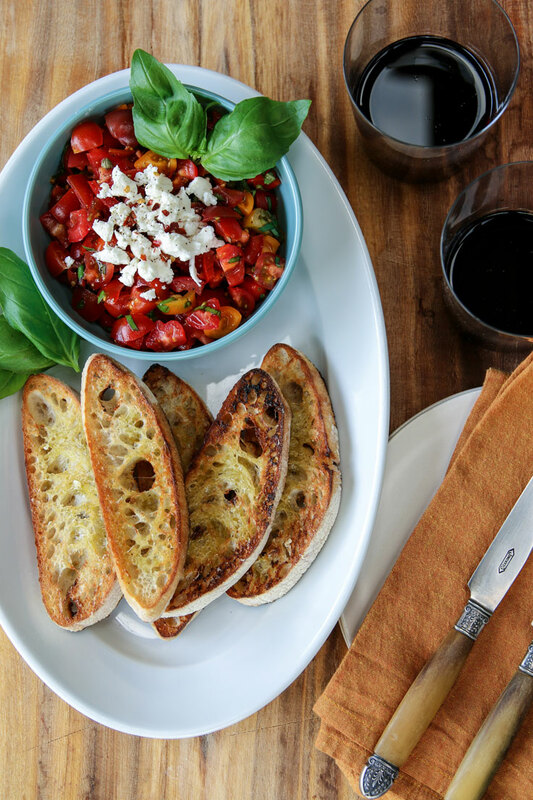 Bruschetta is one of those perfect foods. It is healthy, quick, versatile and inexpensive to make. 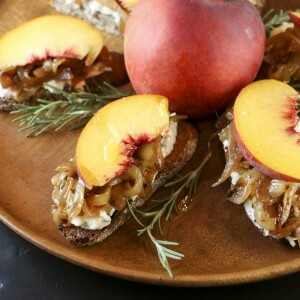 It can be eaten as an appetizer or as an entire meal. 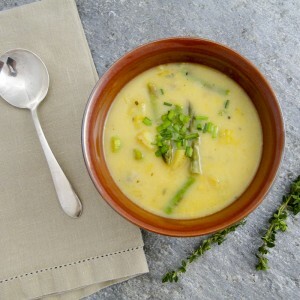 It makes a great Meatless Monday meal to reduce your carbon footprint. 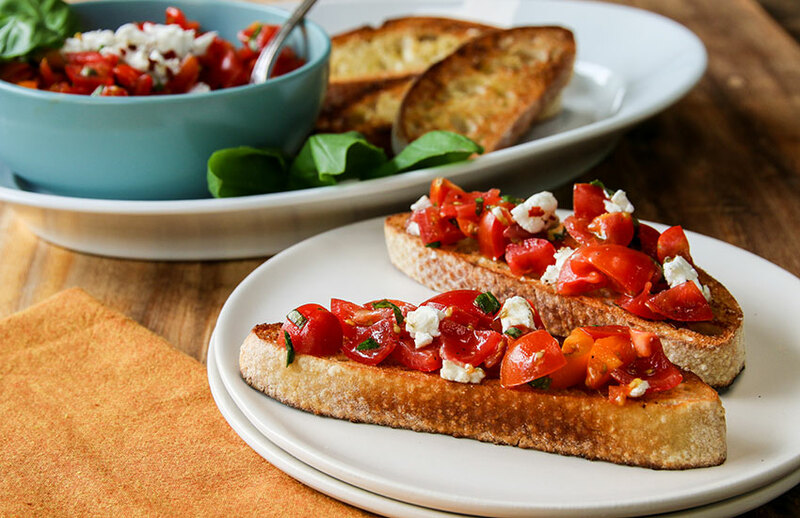 I can't think of anything but good things when it comes to bruschetta. Heat broiler. 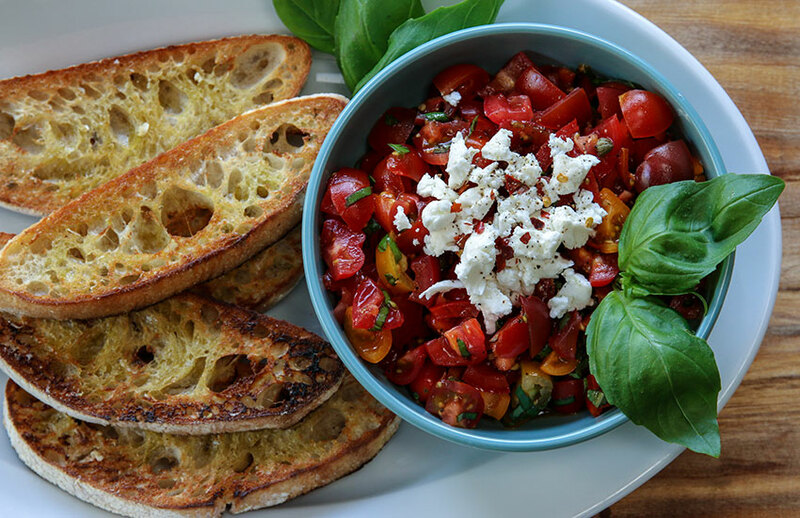 Put tomatoes, basil, feta and capers in a small bowl. Toss with 3 T olive oil and balsamic vinegar. Season to taste. Slice a loaf of ciabatta bread in half horizontally so you have two large flat slabs. Cut these slabs into 2-3" squares. 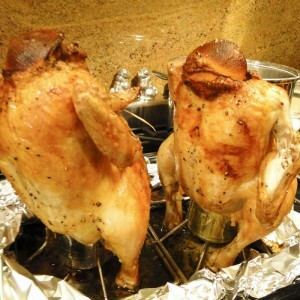 Brush with remaining olive oil and pop under the broiler for a couple minutes, taking care they do not burn. If they do, just pull them out and scrape off the blackened bits. Rub the garlic cloves over the toast. Top with tomato mixture and serve.